We’ve bundled together all the solutions for preventing botched jobs and operator error! This program will take your carpet and floor care operations to the next level. Eliminate dozens of mistakes commonly made by untrained workers. 70 Mistakes Carpet Cleaners Make and How to Avoid Them - Two part video series just released. These are all critical mistakes that can ruin any job. This series will fully train all workers to become experts at troubleshooting and turning out immaculate work. Learn how to curtail inferior results and improve productivity. IICRC Basic Skills Carpet Care Training Program - 100-page manual and 139 slides including test and diploma. Learn the diagnostic and troubleshooting skills that will prevent operator error. Student versions of the IICRC program are also available without the slide shows and videos. Ideal for classroom training with several students who can successfully complete the test and receive an IICRC Diploma. 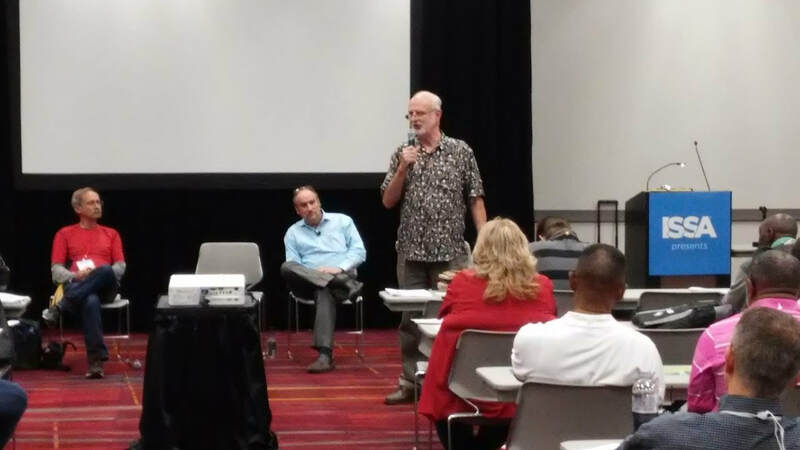 Learn about soil composition, the fundamentals of cleaning, maintaining indoor air quality, pH adjustments and working with stain delamination. 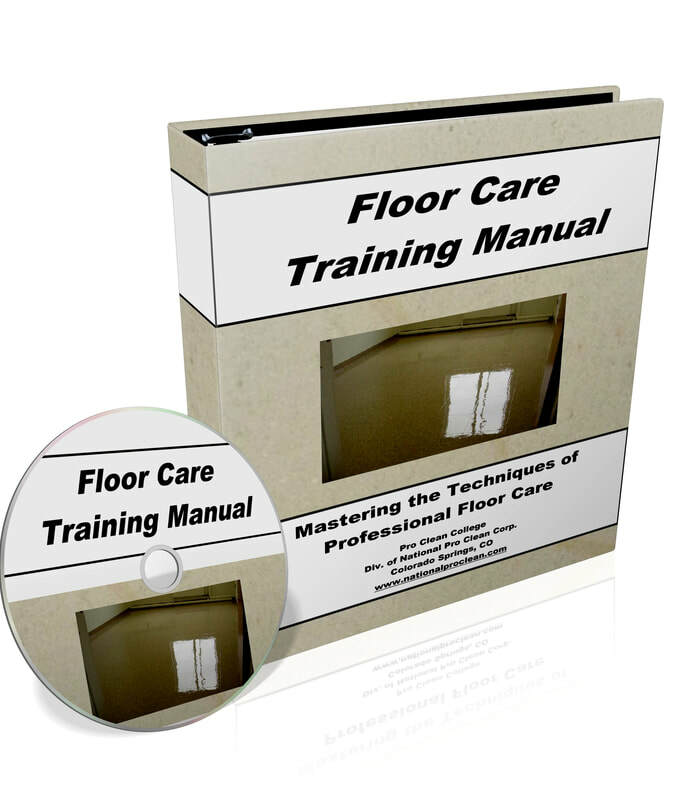 Floor Care Training Program - 100 page manual with slide presentation, test and diploma. Solving 77 Floor Care Problems - troubleshooting booklet. Learn the most commonly made mistakes that produce inferior outcomes. Become an expert at diagnosing, correcting and preventing floor care problems. 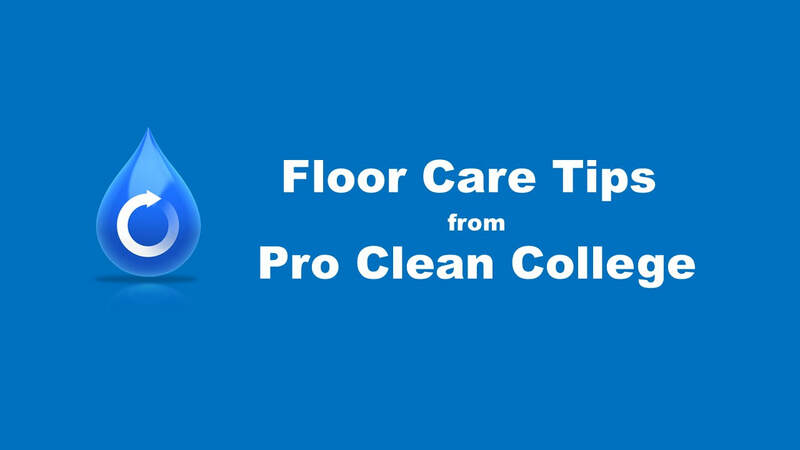 Floor Care Tips - 164 slides showing photos of common mistakes and the best way to solve your floor care problems. 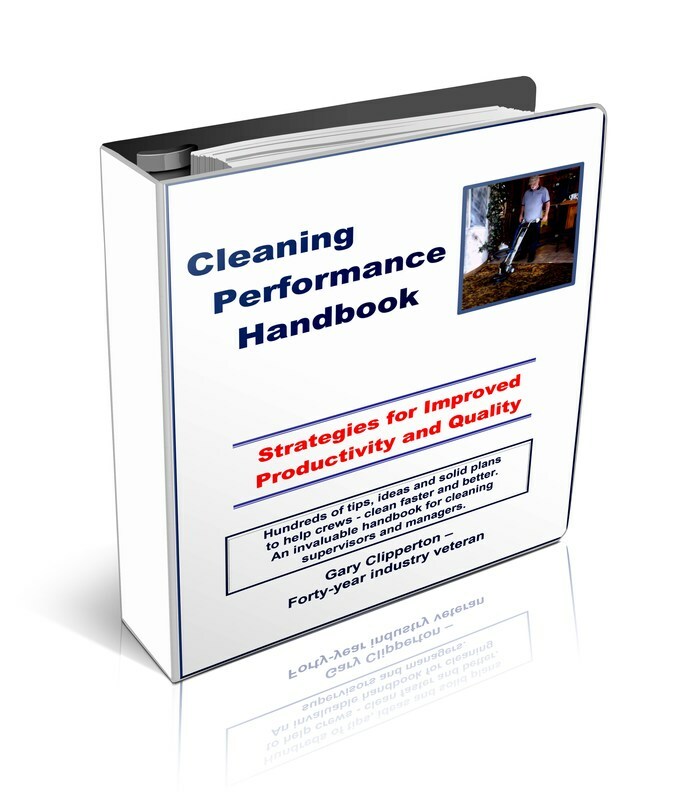 Cleaning Performance Handbook - 250-page manual on improving worker productivity and quality. Learn proper steps to train, organize, workload, motivate and keep good workers. With the download version you have all the materials the same day you order. But the choice is yours. E-version same-day download or hard copy printed and mailed to you. 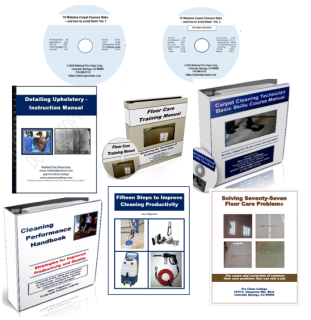 Carpet and Floor Care Management and Technical Training Bundle. 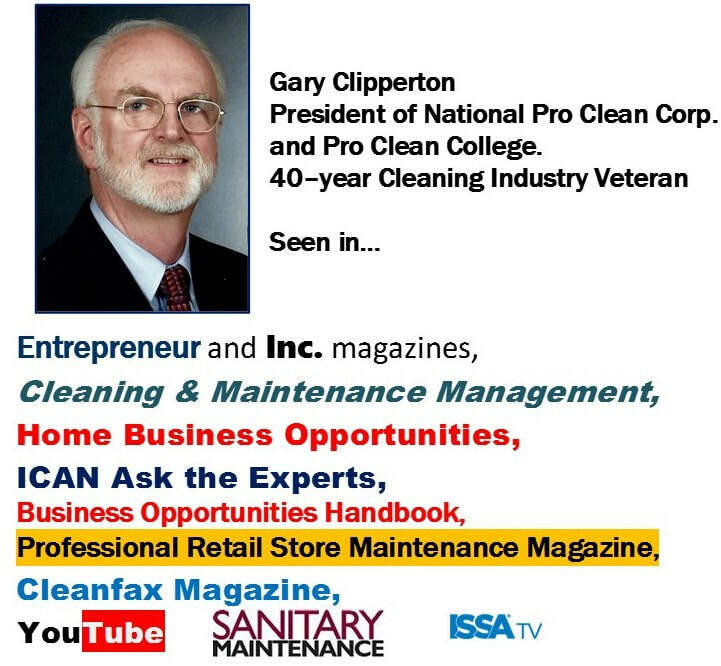 This exclusive two-part video program will help you on your way to becoming an expert in carpet cleaning. If you want to take your operations to the next level, you need to invest in this training program today. 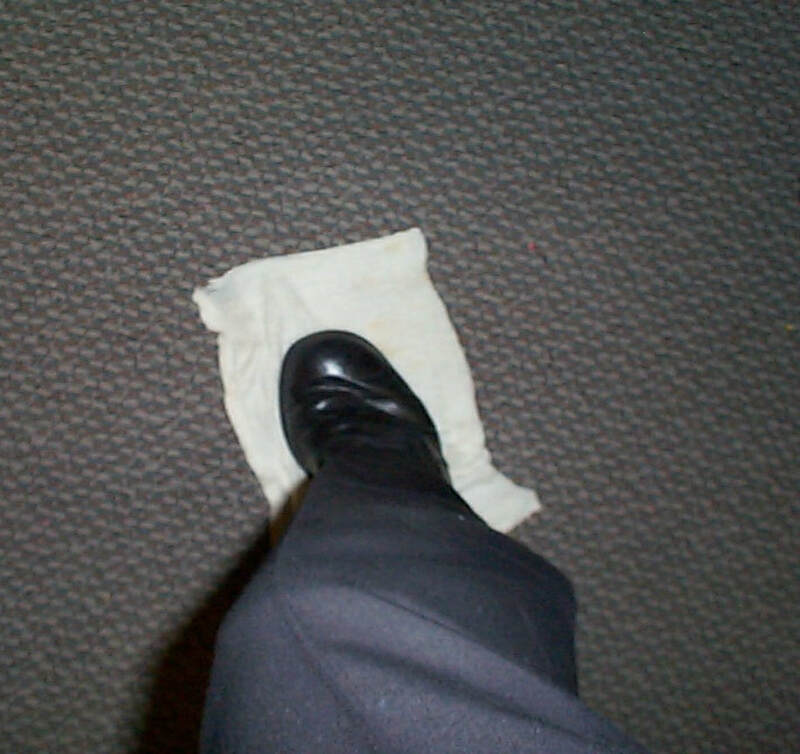 • Mastering the six steps of Programmed Floor Care. • Three types of door mat systems that reduce grit. • Preventative Maintenance Check list – 29 items to monitor in order to reduce floor damage. • Dust mopping – 30 tips to improve the process. • Wet mopping – choosing the right mop head fiber construction, mop handle, mop bucket and cleaning product. • When to double mop a floor, how to reduce deplying, sources of slips and falls, determining proper moisture levels, 18 steps to improved floor mopping, flat mop selection. • Troubleshooting guide: 7 causes and corrections for dull floors, 6 causes and corrections for streaked floors, and 3 causes and corrections fr slippery floors. • Understanding common floor types: VCT, VAT, Sheet vinyl, Linoleum, Terrazzo, Glazed and Unglazed Ceramic, Brick, Mexican Tile, Concrete, Marble, Slate, Granite, Wood, Rubber and Laminate. High-speed burnishing (7 steps), cleaning of pads, propane burnishing (14 safety guidelines and 6 operational guidelines), battery operated equipment and automatic floor scrubbers (15 steps to clean floors). 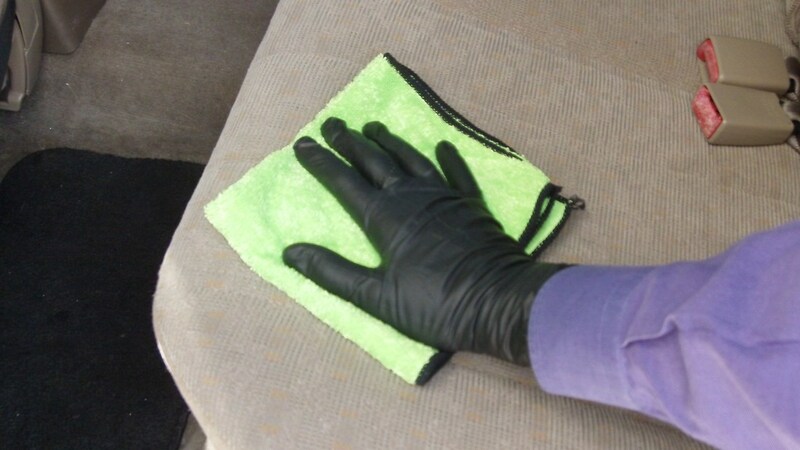 • Scrub and topcoat – when and how. Determining if floors should be stripped or if a scrub and topcoat is sufficient. 15 steps toward improved floor performance. Maximizing autoscrub operations (7 important tips) 11 ways to improve floor finish application and appearance. • Scrub and topcoat Troubleshooting Guide: 3 causes and cures for dried floor finish that contains debris - 3 causes and cures for dried blotches in the floor finish. Causes and cures for lack of uniform gloss, ridges - and stop and start points, and soiled areas in the finished product. • Deep Strip and refinishing of floors – 18 guidelines for chemical safety, how to evaluate buildup levels and stripper concentration dilution ratios (2 test methods), understanding VOC and environmental impact, moving furniture, masking and liquid containment preparations, pad selection, laying out the job, 5 scrubbing tips, determining level of success, 5 tips on improving results, 18 steps for professional floor techs to master, using an automatic scrubber or propane stripper, workloading for larger crews, more operational tips (18 suggestions for improved results). • Proper steps to clean and finish new VCT floors. Learn all of the basic guidelines for proper care of ceramic tile, wood floors, laminate, stone and many other floor types. • Floor Care Quality Inspection Scorecard – tracking quality performance scores. • Cleaning and Maintenance of wood, marble, stone, concrete, rubber, and ceramic tile and grout cleaning. • Glossary – 85 common terms used in the floor care industry. You will find this to be one of the most comprehensive training programs available today. 15 Steps to Improve Cleaning Productivity – invaluable workbook. By following these 15 strategies, your crew will operate at improved efficiency. These 15 steps must be mastered by every cleaning supervisor or manager. Learn to implement proper steps for critical analysis, value engineering, sequential workflow, elimination of backtracking, removal of cleaning restraints, work simplification, acceleration of skill proficiency, and much more. It is very frustrating to send your workers to strip and refinish a floor or clean a carpet to only discover the next day that the job was botched. Now you have to send someone to correct all the mistakes. As you know do-overs are expensive. You thought they had all the skills to pull off the job, so what happened? Actually, there is a big difference between a cleaning worker who has learned to mix chemical and run a machine - and a trained technician who can troubleshoot all types of challenges. There is a lot to understand about the chemistry, dwell times, repeated applications and general problem solving each distinct challenge. We can help you with your training program. Our new and improved Carpet and Floor Care training programs focus on dozens of troubleshooting skills. If a carpet or floor tech does not master all of the necessary diagnostic skills, they can be more of a liability than an asset to your operations. All of the challenges can be met with our training program. It can truly make your crew members experts at what they do. Over the past forty-five years, I have worked with a couple hundred different cleaning crews at hospitals, universities, school systems, government facilities, cleaning contractors and the list goes on. In the majority of the cases, the manager and the carpet and floor care crews were lacking in knowledge of how to solve most any carpet or floor care problem. That is where we come in. Our carpet and floor care programs are extremely thorough and advanced. 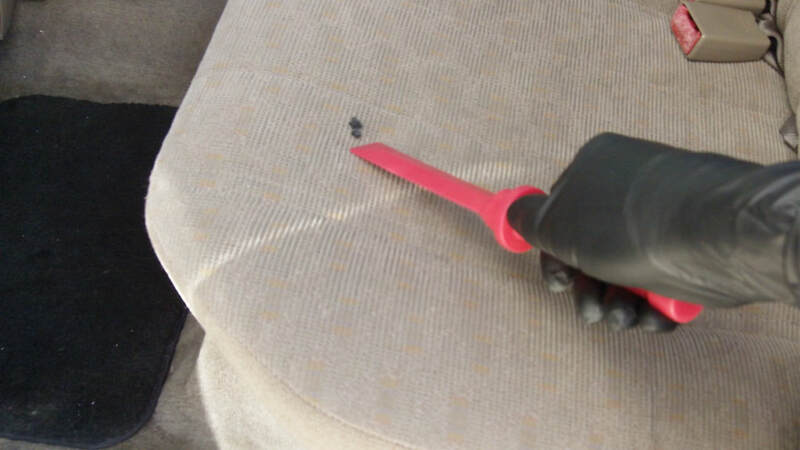 By studying them you will gain new skills and knowledge that very few custodians ever master. Our training program and diploma will set you apart from the others. Why not upgrade your skills today and become an expert at your job? You never know, perhaps obtaining a diploma in floor care could lead to a promotion. Order either the same-day download version or the printed version which will be mailed to you and still receive the download today. You won’t regret this special training program, all in one BUNDLE!